← Kiz Kulesi. The Maiden's Tower. The visit to Sultanahmet, especially in high season, often accompanied by lines to get to the sites, tour groups, much heat and bustle. In the neighborhood, however, found a place diametrically opposite. Silent, cool and dim, Basilica Cistern, or as the Turks called the Sunken Palace, environment that offers mystery that many look on his visit to Istanbul. The walk on catwalks a few inches of water through the forest of columns of 1500 years old, to reach the mysterious head of Medusa, is something that certainly remember our trip. In the time of Justinian I, was decided to build a huge tank it to provide water in case of a siege that damaged the aqueduct of Valens, main supply of Constantinople. The work, Built with waterproof concrete and brick was as effective, a thousand years after the reservoir continued to provide water to the Topkapi Palace Gardens, residence of the Ottoman sultans who had conquered the city. After several times when it fell into disuse, he even lost the memory of their existence, was finally cleaned, restored and opened to the public in 1987. Construction is truly monumental, 10.000 square meters which can accommodate almost 100.000 cubic meters of water. To support the roof is brought 336 columns of marble from all over Anatolia, measured over nine meters and are of various styles, dominate the Ionic and Corinthian. Form a forest of 12 rows 28 columns each. Current lighting is a success and highlights the characteristics of the site, on the whole, is spectacular. 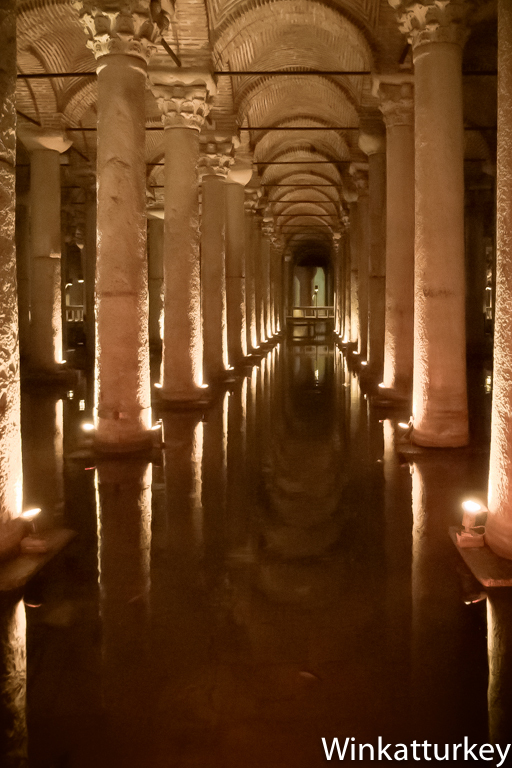 The Basilica Cistern, Yerebatan en turco, accessed by a single input near the Hagia Sophia. We must descend 52 steps to enter this subterranean world, in the dim light and soft music. The water level remains low at present, less than two feet that allow numerous fish swim, some truly amazing size. Over water have been installed spacious walkways that can walk freely. Some indications lead us to places with special significance. The most prominent and famous of all are the heads of Medusa which are at the end of the Tank. They are two huge heads that underlie separate columns with the particularity that is upside down and the other side. This raised many speculations. First, the presence of the heads could be intended to protect the site but may also be due to the need to use all available materials, finally, some say that he wanted to represent the end of paganism, placing them under the weight of the columns. On the other hand, the position of the heads would avoid her gaze petrificaran visitors. Mysteries aside, visit to the Tank is one of the most relaxing city and very different from anything offered by Istanbul.